Aldershot have confirmed tonight that they will appeal Darren Jones' red card against Bury on Saturday. A club statement also says they are 'looking to appeal' Marvin Morgan's red card in the same game, and that further news on that will come late on Monday or early Tuesday. Jones has been handed a one match ban for his dismissal, and Morgan a three game suspension. 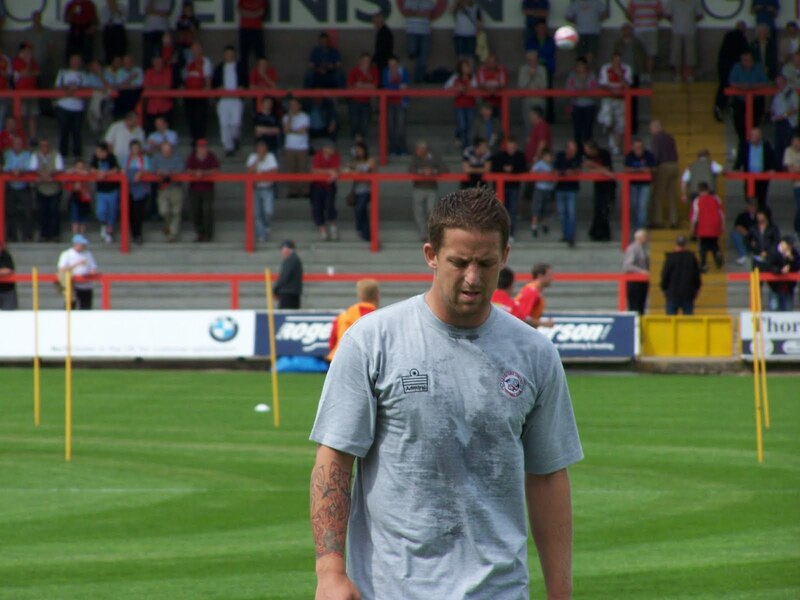 The Shots have also announced that former Cheltenham striker Damien Spencer will definitely miss Tuesday's game. He will be out for three months with a knee injury sustained in training last week. Should Morgan also be ruled out the Shots may be forced into the loan market with Danny Hylton the only full time striker left available for the game. How about this for a "thought for the day"? Hereford United's tally at Stockport yesterday was only one less than they scored away from home in the whole of the 1977/78 season! Their away record that season was played 23, won 0, draw 5 and lost 18. Goals scored 6, goals against 38. Overall just 34 goals were scored in the League. Top scorers were Steve Davey and Steve Compton with just five each. The Bulls came bottom but one in what was then League Division Three. Below then were Portsmouth. Rob Purdie couldn't have had a better start on his return to playing for Hereford United yesterday. Seldom does a winger score two goals in a game and to do so within eleven minutes of the start must be something of a record. "It couldn't have gone any better," Purdie told BBC Hereford and Worcester. "I'm not here to play games to get fit to go back to Oldham. I don't have a future at Oldham whether I score twenty goals or two goals on my loan spell. It doesn't matter. Purdie has had unfortunate injury problems but came through yesterday game without any problems. "I wanted to make sure I was fit. "I had a hip injury and I was mis-diagnosed a couple of times. I had three operations last season. "It's been a long hard year and then I was told I had no chance playing for Oldham. It's been a tough eighteen months. "So it was good to come back to Hereford. It's a club where I feel at home." Purdie revealed that he had contacted the club. "I spoke to Jamie when he first got the job and had a bit of banter with him. "He gave me a chance and I came down and played a reserve game to prove my fitness. "It's a bit of a gamble for him because I haven't played for eighteen months. "I hope to be able to re-pay him." Hereford United can be backed at 13/8 to defeat Aldershot on Tuesday, but only with SkyBet. Other bookies have a win for the Bulls at around 5/4. Stan James and Betfred are also offering 12/5 for a draw. A 1-0 win for the Bulls is 7/1 with Stan James, Ladbrooks and Coral. A 2-0 win for the Bulls is 10/1 with Bet365, Boylesports, BlueSq and 888sport. A 2-1 win for the Bulls is 9/1 with BlueSq and 888sport. A 0-0 draw is 8/1 at most bookies. A 1-1 draw is 6/1 at BlueSq and 888sport. A 2-2 draw is 14/1 at most bookies. As regards first scorer Sean Canham and Stuart Fleetwood are at 6/1, Gwillem Bauza and Mathieu Manset at 7/1, and Rob Purdie at 8/1. These prices are mainly available at Victor Chandler, Boylesports and William Hill and may soften before Tuesday's kick-off. The Bulls entertain Aldershot on Tuesday night looking for their first home win of the season. The two sides are paired in the same division for the fifth time in eight years since the reformed Aldershot gained a Conference place in 2003. Last term the two sides met three times, with a Johnstones Paint match thrown in for good measure. The Bulls scored twice in all three games, with a 2-0 League win at Edgar Street following up a penalty JPT win after a 2-2 draw. That came a month after the Bulls surrendered a two goal lead at the Recreation Ground with just four minutes left to end up with a 2-2 draw. Over 90 minutes the Shots haven't beaten the Bulls since their reformation, with 'only' that Conference play-off defeat on penalties to their credit over the 11 games played so far. The Bulls have recorded three wins on the road, meaning only four sides have recorded more points on their travels, but are yet to claim a home victory in seven attempts. On away form the Bulls would be play-off contenders, on home form bottom of the table. With three home games in succession coming up there should be a change in fortunes as a more free scoring Bulls have renewed the buzz around the city that sparked up with the summer changes. With Manset and Fleetwood both scoring three in three games, and Rob Purdie poaching a pair within a quater of an hour of his debut, the home fans would love one of the goal-filled displays that have excited the travelling support. The Shots could have three of their weekend starters suspended for the trip to Edgar Street as they look to turn fortunes around after a pair of sucessive 3-1 losses. Along with Darren Jones and Marvin Morgan, John Halls starts a three match ban after being sent off in a reserve match two weeks ago. Unlike first team dismissals, bans for reserve game infractions still take 14 days to be imposed. Without Morgan, the Shots look decidedly toothless on paper with just seven goals scored by the rest of the squad. One of those looking to open their seasonal account is former Bulls loanee Marlon Jackson, who has spent most of the past 12 months with the Shots. Hereford United vs Aldershot Town, Edgar Street, Tuesday November 2nd, 7.45pm. Paul Tierney from Lancashire has been given the task of refereeing Tuesday's League Two game at Edgar Street where Aldershot will be the visitors. The Bulls met Tierney twice last season, firstly at home against Bournemouth on September 29th 2009, a game which the Bulls won 2-1 with both goals scored by Marc Pugh. Darren Dennehy was booked. The second game was away at Darlington on April 5th this year. Again the Bulls were the victors, this time 1-0, and again Marc Pugh was the scorer. Jake Jarvis was booked. To date this season Tierney has refereed 11 games in which he has given out 36 yellow and 2 red cards. Yesterday he was in charge of the Derby versus Watford game. Amidst those he booked was former Bull John Eustace and 606's Robbie Savage. As previously reported on BN former Hereford United central defender Darren Jones was sent off yesterday at the Rec as Aldershot were defeated by Bury 3-1. In a game full of controversy Marvin Morgan also received his marching orders as did Shots manager Kevin Dillon. Both Jones (pictured at Morecambe last season) and Morgan are expected to miss Tuesday evening's game at Edgar Street unless the Shots win any appeal they might lodge. Manager Dillon, who was said to be unhappy with several of the referee's decisions, had a word with him at the end of the first half. Then after a challenge from Mozika on a Shots player, Dillon was sent to the stands. After the game Dillon gave his reaction to BBC Sport. "I got sent off for argueing. "We are going to appeal against the two sending-offs." Aldershot are 11th in the League. Tom Burrows reports from Edgeley Park. The Bulls climbed off the foot of League Two as they made it six points from their last two away games, during which they have banged in nine goals. After the four second-half goals at Northampton, they added five more without reply at Edgeley Park - an early double from the returning Rob Purdie, coupled with second-half goals from Mathieu Manset, Stuart Fleetwood and an own goal brushed aside a lacklustre Hatters side. Jamie Pitman’s first game as temporary permanent caretaker manager saw a similar line-up to that which started at home to Accrington with Purdie replacing Dominik Werling on the left flank and Kenny Lunt remaining just off target man Manset as strikers Fleetwood and Guillem Bauza were left on the bench. Stockport remained unchanged as Robbie Williams and co, fresh from announcing a sell-out tour, aimed to make it 2 home wins in succession to cement their mid-table position. Trouble on the motorways meant the boisterous Bulls fans slowly made their way onto the uncovered Edgeley Park away stand and saw the first chance fall to the visitors, James McQuilkin’s free-kick in an inviting position hit straight at the wall. But the travelling fans didn’t have to wait long to celebrate (just nine minutes) as a long ball from Adam Bartlett was nodded on by Manset into the path of Lunt. It seemed the chance had gone until the Hatters defence provided a Halloween treat, dithering to allow Lunt to continue his run and although Glennon smothered well, the ball ran to Purdie – on his return from Oldham - who slotted home through the legs of defender Mark Lynch. As Stockport sought to regroup, another well-worked move saw Manset hold the ball up and square to Lunt in space. Lunt’s shot from the edge of the area was well-saved low by Glennon, but the ball rolled to a grateful Purdie who placed the ball high into the net, sending the visiting entourage into raptures. Stockport rarely threatened in the first half and the Bulls defence looked composed and organised. When they were called into action, a cross from Adam Griffin found the head of George Donnelly whose header seemed destined for the top corner, but as the vast Edgeley Park main stand erupted, Adam Bartlett flung himself to his left to thwart the Plymouth loanee. Donnelly posed the most threat for the Hatters and looked a very useful front man, but the confident pairing of Tony James and Michael Townsend kept the Stockport top scorer at bay on several occasions. When Donnelly picked up a free-kick on the edge of the area he blasted straight into the face of his own player, cueing the entrance of the Stockport physio who doubled as an Arsene Wenger impersonator. Hereford continued to threaten with Joe Colbeck picking up the ball deep in his own half and running 75 yards before his cross flicked up and hit Lynch on the hand referee Drysdale waving away the penalty shouts from the Hereford contingent. 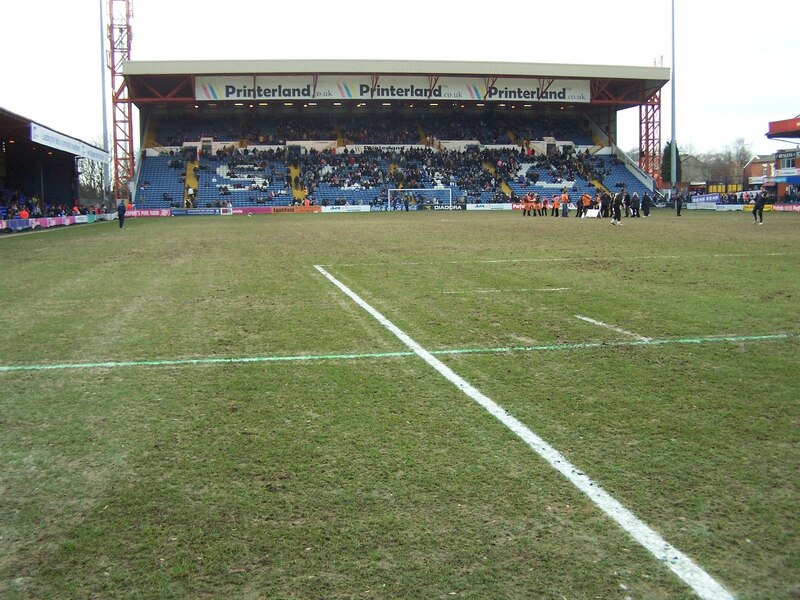 Stockport’s pitch (under previous scrutiny for resembling a beach) was ideal for United’s passing football with McQuilkin to the fore and despite the Hatters having most of the possession as the game petered out towards half time, the pressuring from the Bulls midfield meant they were always going backwards. The last chance of the first period fell to McQuilkin. His pot shot from 25 yards looked destined for the top corner but was well tipped over by Glennon. Following the events of a fortnight ago even the most positive Hereford fan refused to get carried away. However, after 54 minutes, any nerves were settled when a ball from Lunt set Manset through to carry it forward and lift exquisitely over the on-rushing Glennon high into the net. It was the Beast’s third goal in three successive games and he is clearly playing with confidence. He had his markers Jordan Rose and Mansour Assoumani in his back pocket for the whole game. Manset and Lunt were replaced by Fleetwood and Bauza after 75 minutes, obviously signalling that the Bulls refused to accept the scoring was finished. This assumption was backed up after 85 minutes where a ball forward found Fleetwood in acres of space and he ran forward and slotted under Glennon for his third goal of the season (following his double at Sixfields). As streams of Hatters’ supporters left Edgeley Park, Fleetwood raced clear again on the left wing. His shot was well-saved by Glennon and the ball looped up in the air, hit Assoumani and rolled into the net as Fleetwood reeled away in delight and moved the Bulls’ goal difference from -15 to -10 and the Bulls off the bottom of League 2. It was the Bulls largest away victory since their return to the League and their third consecutive League 2 victory at Edgeley Park. Stockport: Glennon, Williams, Assoumani, Rose, Lynch, Pulis, Turnbull, Simpson, Fletcher, Griffin, Donnelly. In his post match interview Hereford United care-taker manager Jamie Pitman had plenty to be pleased about after coming through his fourth league match. "Things are going great at the moment and that's down to the players," he said as reported by the Telegraph. "We're just guiding them a little bit. "We've worked in the week about defending and we've got a clean sheet. They've been excellent - all four of them at the back. Defensively the whole side have worked hard. "Rob Purdie (pictured) is a quality player and he's just got to play. He brought that bit extra to us and I'm really pleased with him to score a couple of goals. "We moved the ball well. In the four weeks we've been involved we're gradually getting better and better and hopefully the penny's dropped that we can perform, but first and foremost we have to work hard." Meanwhile Stockport manager Paul Simpson wasn't so pleased. "We got what we deserved today," he told BBC Radio Manchester. "Unfortunately we've been beaten by a side that's done all the basic things properly and we've just been kamikaze the way we've defended. "We haven't dealt with [Kenny] Lunt playing in that hole just off the big fella Manset. As a team you've got to be organised and get people screaming, but unfortunately we haven't done. "We've got to get ourselves dusted down as these are the same players that have been on a decent run of late but they've had a real wake up call today. "We've got to try to address how we've caused ourselves problems, how to communicate with each other and get a better understanding as we haven't made Hereford work hard for their goals." Just over 100 fans watched the game. Hereford United care-taker manager Jamie Pitman was quick to praise the performance of his side after their 5-0 thumping of Stockport this afternoon. "We have a tempo now," Pitman told BBC Hereford and Worcester. "We are a side that can perform. "We have a shape that we play to. Everyone knows that shape now. It's as simple as that." Pitman praised several of his players. "Stuart coming on again and producing what he produced. "Adam was superb today. Russell has been working with him over the course of the season and he's getting better and better." There were a few players with knocks after the game and Guillem Bauza could miss Tuesday's game against Aldershot. He had a slight recurrance of his groin injury. "Maybe we forced him a little bit, he's just tweaked it again. "However Kenny Lunt played in there and was superb again today. I have no problem with him playing there. "Matty has been up there and he's a great outlet for us. He's doing well. "Stuart needs now to work hard to get into the side. When he comes on and scores like that you can't ignore him. "You need competition for places so if he is coming on and doing that then Manny knows he's got to keep performing. "Because if he doesn't Fleets will be in." Below are the main stats from this afternoon's League Two game at Edgeley Park where visitors Hereford United put five goals past Stockport without reply. Scorers: Purdie (2), Manset, Fleetwood, OG. Referee: Mr Drysdale controlled the game well. Catering: Long queues for half-time refreshments inside the ground. Finished serving 15 minutes after play re-commenced. John Eustace was booked as Watford lost at Derby. Gavin Williams scored for Yeovil in their 3-3 draw with Swindon. 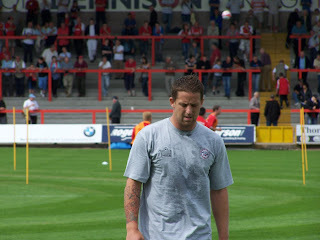 Brian Smikle scored the opener as Cheltenham won at Accrington. Darren Jones was sent off as Aldershot lost at home to Bury. Dean Beckwith scored an equaliser to Chris Palmer's opener as Northampton beat Gillingham. Neither Josh Gowling or Gavin McCallum got off the bench for Lincoln as they drew with Wycombe. Alan Connell scored his 12th goal in 12 games as Grimsby drew with Eastbourne. 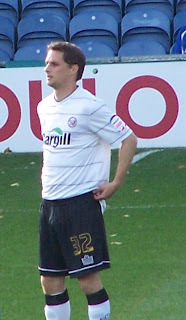 Mark Beesley scored the opener for Fleetwood as they won at Tamworth. Lee Morris scored his first goal for Kidderminster after 13 games as they drew with Southport. The Bulls are off the bottom with a substantially better goal difference than they started the day with, but their rivals at the wrong end of the table also mostly picked up points. Barnet were the only one of the three sides the Bulls could catch to not collect a point as they went down 2-1 at Shrewsbury (4th), leaving the Bees bottom of the table. Northampton pulled themselves out of the bottom two with a 2-1 win over Gillingham that put them on 13 points like the Bulls. Also on 13 are Lincoln, who twice came back from a goal down to draw 2-2 with Wycombe (6th). A point better off are Morecambe, who lost 3-1 at Torquay, with Stockport and the Gills a further point clear. Bradford pulled themselves into mid-table with a 5-0 thrashing of Oxford, while Macclesfield give themselves space with a 2-1 win over Burton. At the top of the table Chesterfield lead by a point after a goalless draw at Stevenage with Port Vale, 2-1 winners over Crewe, and Bury, 3-1 winners at Aldershot, four points inside the automatic promotion spots. Along with the Shrews and Chairboys in the play-off spots are Rotherham and Cheltenham, with the Millers losing 1-0 at Southend and the Robins winning 4-2 at Accrington. In the Conference Crawley retake the top spot after winning 4-1 at Mansfield with AFC Wimbledon losing at home to Darlington 2-0. Forest Green beat York 2-1, while Kidderminster drew 2-2 at Southport on Friday night. FA Cup opponents Hythe Town lost 2-0 to Lordswood in a Kent League Premier Cup match. 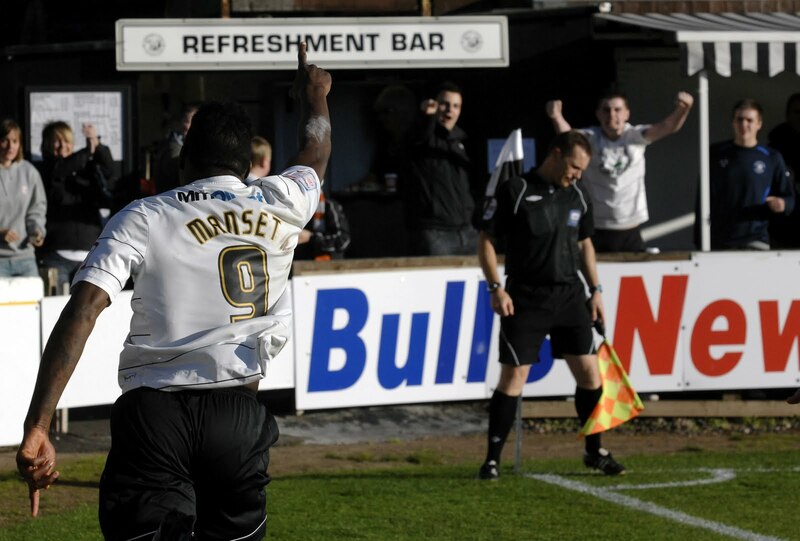 Aldershot are set to travel to Edgar Street on Tuesday without ex-Bull Darren Jones and their top scorer. Jones was dismissed this afternoon in their 3-1 home loss to Bury for a professional foul, while star striker Marvin Morgan followed him down the tunnel for a poor challenge on Shakers midfielder Damien Mozika in the second half. Both will be suspended for Tuesday's match with the Bulls pending appeals. The Bulls are off the bottom of the table after a 5-0 demolition of Stockport at Edgeley Park. Rob Purdie signalled his return with a quickfire double, following up on Kenny Lunt shots, before Mathieu Manset put the game beyond doubt before the hour mark. Late on Stuart Fleetwood scored one and helped the Hatters keeper register an own goal to finish the rout. Former Bulls defender Keith Lowe has hinted at the unhappiness at Edgar Street last season. Speaking to This is Gloucestershire, the current Cheltenham man said: "Moving to a new club was massive for me in the summer. Things didn't go well at Hereford and there is a better atmosphere here – it's friendlier and there is a real desire to work hard for the club." Lowe has been ever present for the Robins this term after making just 17 League starts during his season at Edgar Street. Bradford have signed goalkeeper Lenny Pidgley on a short term deal after a successful trial. He comes to the club due to an injury to regular no.2 stopper Lloyd Saxton. Northampton have loaned defender Seb Harris to Stafford for a month. The 23 year old has started only one game since joining the Cobblers 18 months ago as a striker. Cheltenham have offered former midfielder John Finnegan, the best mate of Steve Guinan, a coaching role in their Centre of Excellence. The 34 year old quit Kidderminster earlier in the month due to a succession of injuries. Departed Kidderminster chairman Barry Norgrove has told the press the board turned down a 'mind blowing' offer to take David Reynold's offer. Norgrove said the deal would have seen £300,000 injected to cover debts and another £100,000 for the playing budget. Hereford United Supporters travelling to Stockport could be affected by the closure of the M56 at Junction 7 for bridge repairs. With the news that Jamie Pitman has been given the seal of approval by the Hereford United board at least for the next two months there is bound to be a lot of interest in this afternoon's match at Stockport. For those unable to be there, BBC Hereford and Worcester will have full match commentary on 94.7FM around Herefordshire. In addition there will be a preview and post match interviews most of which will be available on the internet. Keith Hall will be behind the microphone. He will be joined by former Bull Dixie McNeil. Meanwhile the free trial with Bulls Player, who will also be covering the game, is continuing. However please note that after the trial the price per month is £3.99 which equates to nearly £48 per year. Cheaper deals are available. Finally BN will have a 'new' match reporter at Stockport this afternoon. Hereford United vice-chairman Tim Russon has been telling BBC Hereford and Worcester why the club decided to keep Jamie Pitman in charge until at least the end of the year. "Since Jamie came in the spirit has lifted, the performances have improved, the results have improved and three League matches undefeated, with a bit of luck it could have been three wins in a row," said Russon. "I think Jamie deserves his chance, he wants his chance and he's the man in the driving seat at the moment so I think we would be foolish to rock the boat. "We had a very stormy start to the season and now Jamie has come along and steadied the ship. "When he was at Forest Green as assistant manager I think people who were associated with that club will tell you he was one of the driving forces behind Forest Greeen doing well. "And also he's shown great competence, great leadership in the first few days he's been in charge at Edgar Street. "Everyone has to start somewhere. Young managers have to be given their first opportunity and I think he has done enough to deserve that first opportunity for a few more weeks." Russon spent part of yesterday telling managers who had applied for the job they hadn't got it. "They all said 'we think you have made the right decision'. Russon was reminded of the poor start to the season. "We didn't envisage having to sack a manager so soon in the season. "Having had that problem we've taken the time to sit back and think and work out the next step. "I've spent probably two weeks on the phone to lots of experienced managers seeking advice, listening to their opinions and views on various people who have been in for the job. "We'll keep a watch on it and make sure we don't slip any further. Hopefully Jamie will keep on the improvement and take us up the table." Hereford United's rivals up the A49 have had their plea to keep prices higher at their first round FA Cup-tie at Southampton, than they otherwise might have been, rejected. Here's how the FSF (Football Supporters Federation) have reported the story. The FA have sided with Southampton in a dispute over the ticket prices for their upcoming FA Cup first round tie with Shrewsbury next Saturday, after the League Two club had looked to cash in on their visit to St Mary's. With matchday prices at St Mary's typically between £24-£27 for adults and £16-£18 for youngsters, the club's announcement that tickets for the cup clash will cost no more than £15 for adults and a fiver for kids is a welcome result for fans. The visitors had refused requests to make tickets available at the discounted rate for their visit to League One side Saints. The visitors have a say in ticket prices in FA Cup ties, as well as a vested interest, as the net gate receipts at this stage of the competition are split 50/50 between the competing clubs. The home side, mindful of the fact that they were already due to play three league games at home in November, wanted to reward fans with lower prices and attract a bigger attendance to the tie than they otherwise may have. As is the case when two clubs can't come to an agreement over ticketing in the Cup, the FA had to step in and arbitrate. The FA stipulate in the competition rules that where clubs can't come to a decision that the minimum ticket price allowed for first and second round matches is £10, although Southampton weren't pushing for such a drastic price-drop. While the FA's decision to side with the Saints may well not swell the coffers of the League Two side, we're sure that their fans will be grateful at the £12 saving the FA have 'forced' on them in this instance. Any and all steps that make football more affordable are something to be applauded in our view. Meanwhile Shrewsbury manager Graham Turner has come in for some flack from Southampton supporters who have posted their views about his stance on the Southern Daily Echo website. Suffice it to say he is not flavour of the month on the south coast at present. The Bulls have announced the loan signing of Rob Purdie, while two squad players are shown the door. Current Oldham man Purdie has returned to Edgar Street on a three month loan after featuring for the reserves against Bristol Rovers earlier in the week. Since leaving the Bulls in 2007 after five years and 184 games he spent two years with Darlington before joining the Latics last summer. He has never played a senior game after being injured within weeks of joining the club, and was transfer listed by new boss Paul Dickov. Rob Purdie and Jamie Pitman greeting each other at the Lawn before a pre-season friendly in 2006. Now they are on the same side again. Leaving the Bulls are fringe pair Amadou Rabihou and Samba Kanoute. Cameroonian striker Rabihou started only once after arriving two months ago, while French defender Kanoute made only one sub appearance in the loss to Oxford. Rabihou was due to be with the club until the end of the year, while Kanoute was due to remain for the season. Both have left 'by mutual consent'. Kidderminster Harriers have been sold to one of their former Chairmen, the club have announced. The statement continues that the decision to sell to him gives the club 'breathing space', suggesting that the debts of the club were at a critical point. Former chairman Barry Norgrove has left the club following the sale. Shrewsbury have announced the departure of Club Secretary Jon Harris with immediate effect. A club statement says Harris, who also served as General Manager, has quit to follow an alternative career path. Gillingham have called schoolboy Ashley Miller into their squad to face Northampton at the weekend. The 16 year old has only played three youth team games but is claimed to be a target of Liverpool. Macclesfield have loaned out teenage midfielder Michael Thomas to Mossley for a month. Chesterfield have loaned teenagers Craig Clay and Tendayi Darikwa to Barrow for a month. The midfield pair are first year pros. Oxford have agreed a deal to sign loanee Jack Payne on a permanent deal from Doncaster in January. The 19 year old will sign a two and a half year deal. Rotherham's application to build a new ground will be heard in four weeks time. The Millers hope to be in their new home by the summer of 2012. Port Vale have signed Bradford striker Jake Speight on a months loan. The 25 year old moved into League football in the summer after 17 goals for Mansfield last term, but has started only four games in the League for the Bantams. Bulls caretaker boss Jamie Pitman will remain in the role until the end of the year, the club have confirmed this morning. Pitman, whose three League games in charge has seen the Bulls double their points tally for the season, told the official site: "I can't quite believe what's happened this season. The physio job is a real passion for me but after four games in charge I want the chance to prove to everybody that I can tackle the top job." He will continue to be assisted by Russell Hoult, with David Keyte adding that they "deserve their chance". A run of three league games without defeat has earned Jamie Pitman the chance to take charge of Hereford United until the end of the year. Chairman David Keyte and Vice-Chairman Tim Russon have decided to give Pitman the Caretaker Manager’s role for another two months and put him in pole position for the full-time post. Jamie will be helped by goalkeeping coach Russell Hoult and ahead of them lies one of the biggest challenges with the First Round of the FA Cup and local derbies against Cheltenham Town and Shrewsbury Town all coming up in the next few weeks. For Pitman 34, this season has seen a remarkable turn around. In the summer his job as physio was under threat when the League changed the rules but now just three months later he’s in the hot seat. “ I can’t quite believe what’s happened this season. The physio job is a real passion for me but after four games in charge I want the chance to prove to everybody that I can tackle the top job,” said Pitman. Pitman was handed the caretaker role after the sacking of Simon Davey and has risen to the task with draws against Port Vale and Accrington Stanley and one of the comebacks of the century to win at Northampton. “There’s only one way to go now and that’s up but both Russell and I know it’s not going to be easy and we will be leaving nothing to chance,” added Pitman. Tomorrow the Bulls are at Stockport County and Pitman and Hoult head north with the full backing of the club’s new board. For all the users of the Bulls News Prediction League, don't forget that the league continues when Hereford visit Stockport County tomorrow. Will you back Jamie Pitman and co to do the business up at Edgeley Park? To enter, simply send in your final score and attendance predictions to bullsnewspredictions@hotmail.co.uk. Please remember to include your chosen username. The deadline for the match is at 2.30pm tomorrow afternoon. Hereford United can be backed at 12/5 to defeat Stockport tomorrow but only with Corals. Most others quotes are little better than 2/1. A better price of 5/2 for a draw can be found at Ladbrooks. As regards the first goalscorer in the game, Guillem Bauza (should he pass a fitness test) is 7/1 with a number of bookies, Mathieu Manset and Sean Canham are both 8/1, and Stuart Fleetwood 9/1 with BlueSq and 888sport. A 1-0 win for the Bulls can be backed at 19/2 with Unibet. A 2-0 win for the Bulls is 16/1 with SkyBet, Paddypower and Unibet. A 2-1 win for the Bulls is 23/2 with Unibet. A 0-0 draw is 9/1 with various bookies. A 1-1 draw is 6/1 with BlueSq, Ladbrooks and William Hill. And a 2-2 draw is 16/1 with Skybet. The Bulls travel north on Saturday to face Stockport County in a League Two match at Edgeley Park. The two sides have met in the league in three seasons in recent history, the last when the Bulls dropped out of League One. The Hatters took all six points from the Bulls, helping them to avoid relegation by a single point, but the Bulls had won their two previous trips to Edgeley Park including the opening encounter of their League Two return when a heavily fancied Stockport wasted a hatful of chances to give the Bulls a shock 2-0 win with Stuart Fleetwood bagging one of the goals. The Hatters' fall from grace has been somewhat meteroric. Two years ago they were eyeing the Championship under idolised boss Jim Gannon, now current chief Paul Simpson will be happy to not be a Conference manager come May. Proof of the belt-tightening at Edgeley Park comes with news that highly rated keeper Owain fon Williams has been farmed out on loan to Bury. Hatters fans hope he is sold in the January window to fund the permanent signature of Plymouth forward George Donnelly, who has bagged seven goals in 13 League games since arriving on loan. The rest of the squad in total can't beat his tally. The Bulls have one target for Saturday - be off the bottom of League Two by 5pm. Only Northampton of the bottom four are at home, with Barnet and Lincoln travelling to play-off contenders, and three points should see at least one of those caught. The big tactical decision will again be up front with Jamie Pitman having to decide whether to continue with Kenny Lunt in the link role or play a more traditional front two. Stockport County vs Hereford United, Edgeley Park, Saturday 30th October, 3.00pm. Lincoln City have signed former Bull Josh Gowling from Gillingham on a one month loan deal. "He doesn’t want to sit on the bench, he wants to go out and play games," said Gills manager Andy Hessenthaler. "I can understand that frustration. "He asked to have his name circulated and Lincoln said they were interested." Caretaker manager Jamie Pitman has confirmed that Tony James will be available for selection next Tuesday when Aldershot visit Edgar Street. It had been thought that James would play his last game for the Bulls at Stockport this Saturday. "He's able to play on Tuesday," confirmed Pitman in an interview with BBC Hereford and Worcester. "That will be his last game. "He's done very well, he's steadied the ship. He's done a good job for us. "I know what he is about. He's a good professional. He understands what his role is in the side." In his pre-Stockport comments Jamie Pitman has said he's hopeful of lifting the Bulls off the bottom of the table. "It would be a massive relief to get the club off the bottom of the league — we have been there for so long," Pitman told the Worcester News. "We had a chance to do it last week when we drew 1-1 with Accrington Stanley but we could not find that little bit extra. "If we can do it on Saturday it means we are closing in on the teams above us." Pitman said that striker Guillem Bauza was still struggling with a groin problem and is a doubt for Saturday. He added that he would like to his short-term deal extended. "Guillem has done ever so well and we would love to keep him. Whether we can at this stage, we are not sure. "There haven’t been any talks at this stage, but I’m sure there will be some further down the line." In his pre-Hereford interview, Stockport County manager Paul Simpson has heaped praise on Hereford's care-taker manager Jamie Pitman especially for getting the best out of his players which previous manager Simon Davey failed to do. "I have to say that over the summer when Simon Davey was making the signings I thought he was making some really good signings," said Simpson. "They've got a strong squad of players. But for whatever reason it didn't happen for Simon and another manager lost his job. "The players are showing, probably, closer to what they are capable of probably why Simon wanted them in the club. "But the caretaker has done a great job so far. "It must be difficult juggling being the physio and the manager. So you have to take your hat off to him for the job he has done. "What I'm hoping is that this weekend is that we don't do him any favours at all. "If he is in charge for Saturday or a new manager comes in we have to make sure it's a horrible day for him." Care-taker manager Jamie Pitman will be in charge of the Hereford United squad for Saturday's game against Stockport County. Whether he will still be in charge for Tuesday's game at Edgar Street against Aldershot remains to be confirmed. The situation may become clearer after tomorrow morning's statement from chairman David Keyte. Hartlepool's bid to wind up Billingham Town has been adjourned until Dec 23rd after the Northern League side offered to hand the lease to their Bedford Terrace ground to the League One outfit. The monkey hangers had previously rejected an offer to clear the £10,500 debt, saying that the bill was now £30,000 due to legal fees. Barnet have slammed their local council after they held talks with Saracens rugby club about moving to a local athletics stadium. 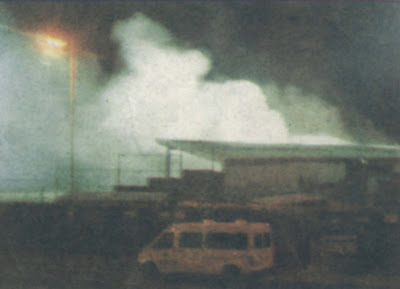 The stadium was targeted by the Bees in 2001 as the site of a new 10,000 capacity stadium which the council rejected. Saracens, who currently play at Watford's Vicarage Road, say they are looking at 30-40 sites and have made no definite decision. Macclesfield have loaned defender Jason Beardsley to Eastwood Town for a month. Kidderminster have acknowledged a number of interested bidders for the club one of which is former Macclesfield and Shrewsbury suit Rob Bickerton, who was strongly linked to Edgar Street in the summer. Lincoln have signed MK Dons midfielder Luke Howell on a months loan. The 23 year old has only featured once for the franchise side this term. Rob Bickerton has been talking to the Kidderminster chairman, Barry Norgrove, about investing in the Conference club. Bickerton has been involved with several clubs over the past few years, most recently at Shrewsbury Town where he was appointed managing director. He only stayed in the post for 18 months before leaving for reasons that never became public. And just five months ago he made a bid for Graham Turner's shares at Hereford United. Turner had the good sense to turn him down. The Chairman of Hythe Town has pledged not to shave until his team are knocked out of the FA Cup. Paul Maitland saw his side defeat Staines last Saturday and is now looking forward to the next round at Hereford in nine days time. "When we won, I promised everyone I wouldn't shave again till we got knocked out," Maitland told the Kent Gazette. "I was very whiskery at the game on Saturday but thought I'd be able to shave afterwards but obviously not. "I'm normally clean-shaven so I find it a bit itchy – but I don't mind. "This sort of thing won't happen again in my lifetime and it's a reward for all of us for all the hard work that goes on, on and off the pitch – it makes up for those frosty mornings when two men and a dog are watching and we lose 1-0. "We said we wanted to get a league club in the draw and we have – and one which hasn't won at home this season so we're thinking 'you never know'." This morning's Hereford Times has suggested that the future of on-loan defender O'Neil Thompson could be under discussion. The paper confirms BN's report that former player Rob Purdie turned out for the Bulls in a friendly last Tuesday but it says that any moves to sign Purdie might depend on other players leaving or going out on loan. Thompson is on a season long loan deal from Barnsley. The deal was arranged by former manger Simon Davey. Meanwhile moves to extend the loan of Tony James from Burton are under way. for another month," said Burton manager Paul Peschisolido as reported by the Burton Mail. "However, we have had a few injury concerns so we will see how things are after Saturday and take it from there. "He went to Hereford to get some games and to keep his fitness up, and to cheer him up because he was not getting games here — Hereford is his home club and he doesn't have to travel two hours for training. "Hereford have told us that he has been playing well, but I don't need to receive reports on him because I know he is a quality player." The Bulls' board of directors had not even reached the subject of a new manager when they faced the VP membership tonight. With the board meeting running over the trio arrived 30 minutes late for the 7pm start and departed an hour later to resume their meeting. UPDATE Thursday 10am: Hereford United say a statement will be released about the manager situation tomorrow. Hereford United have announced that ticket prices for the FA Cup-Tie against Hythe Town on November 6th will be as for League Games. Graham Turner, now manager of Shrewsbury Town, is to receive the Freedom of the City of Hereford for his 'immense personal contribution and total commitment'. There will be a ceremony in Hereford's Town Hall next Sunday when Turner will be given the award. Southend have made further redundancies at the club. Goalkeeper coach Lee Turner, kitman Steve Parmenter, and 'transfer advisor' Billy Jennings have all been axed to save money. Bradford are trialling former Millwall and Chelsea keeper Lenny Pidgley. He was released by Carlisle in the summer. Ex-Bull Craig Mawson will play for Burnley reserves today. The 31 year old keeper effectively ended his playing career when he left Hyde to take a full time coaching role with the Clarets but a player shortage means he will be fielded. Rochdale boss Keith Hill has had to issue a statement denying that he accused referee Craig Pawson of bias in their weekend match with Bristol Rovers. Rotherham will see the loan of Exodus Geoghaghon end this weekend with Ronnie Moore wanting a permanent January transfer, but Peterboro will have to lower their claimed £100,000 asking price. Forest Green are to revert to full time status with immediate effect, with new chairman Dale Vince funding the change. Stevenage have signed Birmingham midfielder Jay O'Shea on a months loan. The 22 year old made the switch from Irish football 12 months ago but has made only three sub appearances for the Blues since. Amongst the FA Cup replays last night Tamworth won at Grimsby, and Dover beat Farnboro to set up a local derby with Gillingham. Bury have rejected an approach from Lincoln for defender Ben Futcher. The former Imps player has played just four games for the Shakers this term. The board of directors at Hereford United are due to meet today. On the agenda is the position of manager at the football club. Jamie Pitman recently stepped up to become care-taker manager after Simon Davey was sacked. Whether the board will confirm his appointment on a permanent basis, or possibly give him a few more matches in charge, remains to be seen, but since taking over he has guided the Bulls to three League games without defeat. Pitman has been well supported by goal-keeping coach Russell Hoult and the two of them will surely feature in the clubs plans even if someone else is brought in either as manager or perhaps director of football. Meanwhile there is speculation that chairman David Keyte could announce a new addition on the board. Currently there are just three directors, Keyte, Tim Russon and Grenville Smith MBE. Hereford United care-taker manager Jamie Pitman features in the Football League's latest Podcast. Pitman talks about his experiences of stepping up from club physio to care-taker manager. Also in this podcast is a feature by former Bull Phil Stant. He talks about the new memorial in tribute to the thousands of men who fought in the Footballer's battalion in the Great War. Stockport is generally a good day out although recent experiences have suggested that their stewards can be a bit less tolerant than some. Visiting fans are normally accommodated on the seated but uncovered Railway End although in bad weather, they are often allowed to move into part of the Popular Stand. Advance tickets are available through the Club office. COACH – The only known coach travel is organised by HUISA. Departure is set for 9.30 am from Legends with a fare of £17 (£19 non-members). TRAIN – Departures from Hereford Station are at 07.55, 08.55, 09.55, 10.55 and 11.55 with the latest arriving in Stockport at 13.58. Journey time is a little over two hours. The ground is around half a mile from Stocky Station (several good alehouses en route). Exit the station and turn left up Station Road, go straight over a roundabout and then left into Caroline Street for the ground. Return trains leave at 17.40 and 18.39. ALEHOUSES – Plenty to choose from in the main street and around the ground with many serving the excellent Robinsons' beers. The Crown Inn is a fifteen-minute walk north from Edgeley and can be found under the railway viaduct by the M6 on Heaton Lane. It was the Stocky CAMRA Pub of the Year in 2008 and regularly has around a dozen pumps including a couple of ciders as well Stowfords keg. The Market Place is a good area to head for where you will find a selection including the Pack Horse and Bakers Vaults (Robinsons). The local 'Spoons is the Calverts Court at 13, St Petersgate in the centre. There is a small Labour Club next to the visitors entrance to the ground which I have used a couple of times. They charge a small admission fee but it is particularly handy for the late arrivers who want a swift one before the game. Finally, The Armoury is just five minutes from Edgeley and is likely to be my destination. It can be found at 31 Shaw Heath. It carries Robinsons' Hatters, Unicorn and Old Tom. If the Old Tom tempts you you're advised to treat it with respect, as it is 8.5%! The Armoury is well used by home fans but well-behaved visitors are usually made welcome. SkyBet have dropped the odds on Dave Penney becoming the next Hereford United manager. Earlier today they had Penney at 11/4 but he is currently at 1/2. Jamie Pitman has gone out to 11/4 from 6/4 and Martin Foyle is now 4/1 from 3/1. As for Victor Chandler their prices have slightly changed since this morning. Every time one drives or walks into the Merton Meadow car park from Blackfriars Street, you pass the Hereford United Sportsmans Club which has been in ruins since it was badly damaged by fire in October 1995. 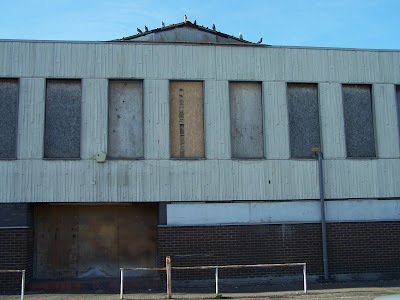 The club was built in 1973/74 at a cost of £200,000. It was officially opened by Joe Mercer in a special ceremony in 1974. And for the next 21 years it became a much loved part of Edgar Street. The fire was believed to have been arson and some months later a man from Plymouth did face charges. However there were many who thought that others might have been involved. Here's a report from the time. Football club bosses last night pledged to play on despite an arson attack which caused hundreds of thousands of pounds worth of damage at Hereford United's Edgar Street ground. More than 100 firefighters tackled the blaze at its peak in the early hours yesterday. The Third Division club is now in a race against time to make the ground safe for its game against Torquay United on Saturday. Structural engineers have been called in to assess any damage to the main stand and the Football League will have to be satisfied with the safety of the ground before the game can go ahead. The blaze started shortly after midnight on Sunday and gutted the Sportsman's Social Club and then swept into the second floor Starlite Rooms above. Severe damage was caused to offices and the bootroom with footballs distorted out of shape by the heat. Police believe an accelerant was used to start the fire. The club will have to assess damage to the electrical systems, computers, phones, security TV, public address systems, photocopiers and other machines. Arsonists are believed to have struck at the club last Tuesday but petrol poured through a door failed to set it alight. Managing director Robin Fry, dressed in a tracksuit as he cleaned up said "We have had two years of vandalism - this is the ulitimate." But he reassured fans everything would be done to make the ground useable for Saturday. Director and club secretary David Vaughan stressed "The main business of football goes on. "Assuming the fire was started deliberately I fail to understand the mentality of people who do that sort of thing." To add to the problem of the fire it was later revealed that there had been problems with the insurance. Back to the present and current Hereford United chairman David Keyte would like to see the club rebuilt. But that's not on the top of his agenda so the eyesore will remain much the same as it has for the past fifteen years. Bulls News would like to thank Ron Parrott for his help with this article. BN has received unconfirmed reports that today's training match finished as a one-all draw. O'Neil Thompson is believed to have scored the Bulls' goal with a header. The line-up is understood to have included Heister, Weir, Gwynne, Kovacs, Bigga, Werling, Stratford, Zak, PURDIE, Canham and Fleets. The Hereford United FA Cup first round tie against Hythe Town has not been selected for live TV coverage. However there are hopes that ITV will still cover the game for their highlights programme, but this is yet to be confirmed. Teams who have their game televised live get a payment of £67,500. Hereford and Hythe will get a small fee if the game at Edgar Street is picked for highlights. ESPN will broadcast Rochdale's home game with FC United of Manchester on Friday, November 5 and Huddersfield's trip to Cambridge United the following day. ITV will show Southport's match at home to fallen giants Sheffield Wednesday on Sunday, November 7. The fact that the Bulls will not be live on TV means that the game will take place on Saturday November 6th with a 3pm kick-off. Hereford United chairman David Ketye has made a few comments to the Worcester News in advance of tomorrow's board meeting. It is thought that a statement will be issued after the meeting clarifying whether Jamie Pitman will stay as caretaker manager. "That is down to the caretaker manager. We have a board meeting tomorrow and we will be talking about the management situation. "I think the team have done very well in the last three games." Hereford United have announced that they will have a special hospitality deal on offer for supporters on the day of the FA Cup-tie against Hythe Town which is expected to be Saturday November 6th. Fifty Golden Cup Tickets are on offer to Hereford United fans. To celebrate the FA Cup First Round Tie against Hythe Town the Bulls are organising a special Cup day. For just £35 a ticket fans can kick-off their day with their very own pre-match meal in one of the club’s hospitality suites as they take in the live action from one of the TV games of the day. Before and after the match they’ll also get the chance to meet and talk with the United cup heroes of today and yesterday. They then get to watch the United v Hythe game from one of the best seats in the stand before selecting and crowning their very own Man of the Match. The Golden Cup Tickets are on sale now. You can call in to the office, phone or e-mail. Meanwhile Bristol Rovers will be at Edgar Street for a behind closed doors friendly this afternoon. The latest odds from Victor Chandler for the vacant Hereford United manager's job show that Dave Penney is close to becoming favourite. And current care-taker manager Jamie Pitman has dropped to third favourite. Meanwhile Skybet have kept their prices the same this morning keeping Jamie Pitman as favourite. Darren Drysdale from Lincolnshire is set to referee next Saturday's League Two match between Stockport County and Hereford United. Supporters may remember he was the referee at Edgeley Park on August 5th 2006, the day the Bulls returned to the League and won the game 2-0 thanks to goals from Stuart Fleetwood and Tamika Mkandawire. Since then the Bulls have only met Drysdale once, on New Years Day 2008 when he was in charge of a home game against Notts County which ended goal-less. In fact Drysdale only refereed two League games last season and just twelve the season before. His other occupation is a sergeant in the RAF. Drysdale is no stranger to controversy. In 2006 he booked Dean Windass for swearing at him in an offical car park at Bradford. The player received a five match ban. Then there was a game at Northampton in April 2008 when he made the visitors, Oldham, change their socks. To date this season he's only been in the middle for one game in which he gave out two yellow cards. Jamie Pitman's odds to become the next permanent Hereford United has eased but he is still favourite to get the job. Martin Foyle remains second favourite and Dave Penney's odds have firmed. Victor Chandler has Pitman and Foyle on the same odds. Seats for the HUISA coach to Edgeley Park on Saturday are still available and can be booked through The Club office up 'till lunchtime on Friday by calling 08442 761939. The fare is £17 (£19 for non-members) and departure is set for 9.30 am from Radford’s. A full BN travel guide will be published later in the week. Notts County have sacked manager Craig Short after Saturday's loss at Colchester. The Magpies are just four points short of the League One play-offs but have lost three of their last four games. Rotherham have signed Arsenal midfielder Mark Randall on a three month loan. The 21 year old has had previous loans at Burnley and MK Dons. Sheff Weds say their takeover is still on course despite a promised £2million advance not being paid and questions being raised over the integrity of people involved in the bid. They needed the money to meet running costs but the payment, revealed to be from a Dubai based company that rents out oilfield equipment, has not surfaced. The club are also talking to other bidders. Bury management pair Alan Knill and Chris Brass have extended their contracts until the end of the 2011/12 season after guiding the Shakers into the automatic promotion spots. Their first action this week will be to find a new keeper after Cameron Belford suffered a cheekbone injury at the weekend. They have to wait for the swelling to go down before they find out if it is fractured. Seven people were arrested after incidents during and after Shrewsbury's match at Chesterfield. One of those arrested was 66. The Shrews are to host an Elton John concert on their pitch. Former Bull Danny Blanchett suffered a concussion and needed stitches to a head wound after being stretchered off during Crewe's win over Aldershot at the weekend. No Bulls in the Team of the Week. Morecambe and Chesterfield have two players in the XI each. Northampton have ended the loan of QPR winger Josh Parker early after he asked to leave when told he was not starting for the Cobblers at the weekend. Southend have opted not to extend the loan of young Cardiff forward Nathaniel Jarvis. Bradford have lost the services of Man Utd loan duo Reece Brown and Oliver Gill as the defenders are required back at Old Trafford for reserve team duties. The Bulls have a player in common with FA Cup opponents Hythe Town - Peter Heritage. The 'Wing Commander' played for ten sides in the South East area both before and after his brief Football League career, with the most notable being Hythe. They sold him to Gillingham for £30,000 to become a FL debutant at the age of 28 just seven months after the Kent League side paid a combined £4,000 fee for him and teammate Terry White. Heritage joined the Bulls, initially on loan, in January 1991 before a permanent £20,000 move in March. He scored ten times for the Bulls in 18 months before moving on to Doncaster. He returned to non-league football in the summer of 1993, playing for a string of sides including Woking and Margate. More recently, with his 50th birthday coming up next month, Heritage has been assistant manager for Bexhill United. He still makes the odd appearance in their line-up. Accrington Stanley manager John Coleman has backed Jamie Pitman to become Hereford United's permanent manager. Stanley, who scored first, draw 1-1 with the Bulls at Edgar Street last Saturday. "The way Jamie set up his team you wouldn't think it was his first crack at management," said Coleman. "It'd be nice to see him get the job." The Board of Directors are to face the VP Club members on Wednesday night for a belated VP Club AGM. After a previous meeting a month ago to discuss future options, the Board will now formulate a plan with the membership for the future of the esxecutive lounge. The meeting will come immediately after a board meeting at Edgar Street that is likely to include further discussions on the managerial position at Edgar Street. As usual Bulls News will have a report from the VP meeting. Hereford United's Youth Team will travel to Coventry Sphinx for their FA Cup-tie on November 2nd. Yesterday the young Bulls draw their Youth Alliance game with Oxford 0-0. Hythe captain Dave Cook has told Kentish Football that his teammates feel like they've won the FA Cup after making the First Round. The Kent League side had a brief taste of success in the late 1980's after property developer Tony Walton spent heavily on the side. But he suddenly withdrew support and folded the club in 1992, shortly after an FA Vase semi-final appearance, and they had to start from scratch in the amateur leagues with their Reachfields Stadium the only reminder of Walton's involvement. Hythe Town manager Scott Porter has given his reaction to being drawn against Hereford United in the first round of the FA Cup. "We’re just enjoying every moment - no one would have dreamed we’d have got this far in The Cup," said Porter. "On our day we can beat anyone so whether it’s home or away we’re always in with a chance. We’re going to make a weekend of it and it’s going to be a great day for the football club." This short history of Hythe Town, which is situated on the coast about 12 miles west of Dover, comes from their website. Hythe Town Football Club were formed in 1910 and played at South Road recreation ground in the Kent Amateur League until the mid-1970’s. In 1975 they won the Kent Junior Cup and were granted senior status, entering the Kent League and playing at the newly acquired Reachfields, an old army training ground. Town were runners-up in the Kent League in 1979, 1983 and 1986 but it was not until property developer Tony Walton took over, forming Hythe Town 1988 Limited, that things really started to happen. In 4 ½ seasons Town won the Championship in both divisions of the Kent League and promotion to the Southern League. The ground had been developed to Southern Premier standard but further promotion was not achieved although attendances rose to an average of 430 (season 1989-90). The new Chairman was a high profile character who attracted much media attention with his big spending. The F.A.Vase was Hythe’s main aim (one year they were made national favourites by the bookies) and they just missed out on the Wembley Finals of 1990 and 1991, going out in the Semi and Quarter Finals respectively. Locally they regularly turned over major non league sides such as Hastings, Folkestone, Margate and Dover. Cup success came in the Kent Senior Trophy, and Town won the Eastern Professional Cup twice defeating Harlow and Collier Row in consecutive finals going unbeaten from 1989 until mid season 1991-2. They were also the losing finalists in the Southern League Cup (v Chelmsford City) and in the 1992 Kent Senior Cup (v Bromley). However that match, played at Priestfield Stadium, became Walton’s last game in charge, and he put the Club into liquidation soon after. Supporters entered a scratch side, Hythe United into the following season’s Kent County League and negotiated continued use of Reachfields Stadium, regaining senior status and rejoining the Kent League in 1995. In 2001 Hythe dropped the “United” tag and went back to “Town” and in November 2002 appointed Paul Fisk as Manager and apart from the season 2005/6 have become a regular top six Club. Even in 2005/6 however, Town struck form in the F.A.Vase only going out to Winchester City in the 4th round proper, before a crowd of 441 at Reachfields. In season 2007/08 Hythe forced themselves to the top of the table and in Spring were considered to be favourites for the title. Disappointment was acute therefore when form was lost in the final weeks and the side not only slipped to 4th place, but also lost in the League Cup Final 1-0 to Erith Town. Despite this it had been a fine season, with a good F.A.Cup run including a fantastic win over Dover before 1,109 at Reachfields, and a Ryman League ground grading achieved. There was also the Golden Boot award to striker Mike Smissen who scored 48 goals during the season despite missing 7 games through injury. In season 2008/9 Town made their strongest bid yet for the title, but finished as runners-up after leading for much of the season. On the Management side, Paul Fisk stepped down at the end of the season due to the illness of his wife Pam (who sadly passed away in May 2010), and Scott Porter took over with the help of Clive Cook and Martin Chandler, the club ending the next season in third place. The 2009/10 season also saw Town progress through three rounds of the F.A. Cup to be drawn against the full-time professionals of Woking who were very relieved to escape with a replay after an exciting 2-2 draw at Reachfields. The replay was another tight match until the last few minutes when Woking scored three times to go through 5-1. This season Hythe have made a number of key signings and have appointed local footballing legend Nick Dent as Coach in another attempt to gain promotion to the Ryman league. Hereford United will play Hythe Town at Edgar Street in the First Round of the FA Cup. The game is expected to take place on Saturday November 6th. Hythe are the first Kent League team in 53 years to reach the First Round Proper and only the second Kent League team ever to reach the First Round Proper of the F.A. Cup. Yesterday they defeated Staines 2-0 to reach the first round with goals from Mickelborough and Cook. Hereford United and 47 other League One and Two clubs join 32 Non-Leaguers in the draw for the first round proper of the FA Cup tomorrow (Sunday). The Bulls are number 21. The draw will take place during an ITV Sports programme which starts at 12.30pm. Accrington Stanley manager John Coleman told the press that he was happy with a point at Edgar Street this afternoon. "We've got to take it as a point gained," said Coleman. "Edgar Street is a difficult place to come and I must say I thought it was a smashing game for the neutral. "I know there aren't too many neutrals in the ground but I thought it was a smashing game and both teams didn't settle for a point, both teams wanted to go and win the game. "Some good football was played, there were some good chances, some good goalkeeping at both ends and their keeper probably made more saves than ours did but we had to thank the woodwork for a couple of saves as well so in the end probably a draw was a fair result." Hereford remain at the foot of the table after this afternoon’s draw with Accrington Stanley, but Jamie Pitman remains undefeated as manager. The Bulls missed the trickery of Guillem Bauza, apparently suffering from a groin strain, although some pundits suggested he was forced to enact the reincarnation of Billy the Bull. Some spice is always provided in this fixture by Stanley boss John Coleman, making a dubious pre-match claim that he had a good rapport with Bulls fans, and opting to occupy the technical area today in a bright red trackie rather than his usual used Hyundai dealer’s suit. In the early exchanges, the home side forced two corners, both of which were whipped across menacingly by Jimmy McQuilkin, able to start despite a midweek flu scare. Mathieu Manset combined well with Kenny Lunt and Joe Colbeck but could not control his shot. Luke Joyce fired over when well placed for the visitors before Manset battled well to win possession, play a one-two with Lunt, but once again his first touch denied a good chance. Defending with comfort, it came as a shock when, after 25 minutes, Hereford went behind. It looked an innocuous move, but the back line got pulled across to the left. Spotting this, a delightful backheel from Tom Smyth fell perfectly for an unmarked Jimmy Ryan to slot home. Manset’s trademark bustling run, complete this time with a blatant (unnoticed) handball, saw him forge a path into the box, but his shot was straight at Alex Cisak in the Stanley goal. McQuilkin shaved a post with a free kick, and Dominik Werling’s effort took a wicked deflection before being scrambled to safety as the home side searched for a leveller. Lunt’s threaded pass asked a lot of Joe Colbeck, but at lightning pace he almost managed to flick the ball past Cisak. Half time arrived with the Bulls down but not out. McQuilkin crashed a splendid effort against the woodwork, as the Bulls rather disjointed efforts failed to trouble the visitors’ goal. Then a through ball found Manset, he lifted the ball over the keeper, and just as home fans feared impending disaster, the Frenchman rolled the ball home for a deserved equaliser with the stadium clock showing 54 minutes played. To Stanley’s credit, they did not retreat into their shells, taking the game to Hereford in an attempt to regain the lead. The game became more open, but lacked fluency, and some frustration was caused by referee Mr Tanner’s habit of allowing much physicality at times, but then awarding free kicks for lesser offences. He did, however, try to play the advantage rule, but the game stubbornly refused to flow. Adam Bartlett deserves several mentions in dispatches for keeping his side on level terms. Splendid saves from Charlie Bennett and a Terry Gornell piledriver in particular caught the eye. The lively Ryan was also denied, before he put the ball on a plate for Leam Richardson who fired wide. At the other end a Werling corner was palmed to safety with some difficulty, and McQuilkin intercepted a clearance and chipped an effort narrowly too high. Pitman introduced Stuart Fleetwood in an attempt to repeat last week’s heroics, and he buzzed purposefully about. A Ryan Valentine cross destined for Manset was tickled away from the striker’s right boot, and Fleetwood was then denied by a last ditch tackle by Dean Winnard. Meanwhile, a terrific double save by Bartlett prevented Accy from regaining the lead. Sean Canham returned from suspension and seemed intent on making an impression with a lively cameo. He helped to create a couple of chances with Fleetwood, but it would not fall ideally for Lunt. The boy from Newent then attempted a shot from an acute angle which was well saved, before Bartlett made another fine point blank stop. Deep into stoppage time, Fleetwood played a pass back to Valentine, who crossed to Canham. The striker seemed to be hauled down in the box, but the penalty kick was not awarded. A slight hiccough on the road to recovery, maybe, but onwards, and (hopefully) upwards. Meanwhile, Accrington still seek their first Edgar Street victory. Bartlett, Green, Towsend, James, Valentine, Rose, Werling (Fleetwood 72), McQuilkin, Lunt, Colbeck, Manset, (Canham 80). Cisak, Winnard, Hessey, Bennett, Edwards, Richardson (McConville 78), Smyth, Ryan (Turner81), Joyce, Parkinson, Gornall. The great secret signing announced by Hereford United last Monday turned out to be, as expected, Billy The Bull. He was introduced to the supporters just ten minutes before the start of this afternoon's game. Current Bull Sam Malson's FA Cup adventure ended early as Redditch had a man sent off in losing 2-1 at Guiseley. Theo Robinson scored twice as Millwall beat Derby. Joe Anyinsah scored as Charlton won at Carlisle. Michael Rose came off the bench to score a late equaliser for Swindon in their draw with Leyton Orient. Steve Guinan was an unused sub as Northampton lost at Oxford. In the FA Cup Neil Mackenzie scored for Tamworth, and Alan Connell for Grimsby, as the two sides drew. Jamie Tolley scored for Wrexham as they lost at home to Southport. Jimmy Harvey won't be in the First Round draw after his Stalybridge lost 2-1 at home to Eastwood. Defender Tony James has said that he is enjoying his stay at Edgar Street. However his loan spell ends after next Saturday's game at Stockport. "At the moment that's it," said James told BBC Hereford and Worcester. "It's a difficult situation with no man in charge at the moment. There's no one really there to make a decision if they want me to stay or not. "I need to speak to Burton as well. They may need me back as they have had a few injuries. "We'll see what happens this week, whether someone gets appointed, and we'll go on from there. "I've really enjoyed it. At the end of the day I'm playing football. "It's close to home, it's perfect for me and I'm getting on really well with the lads."